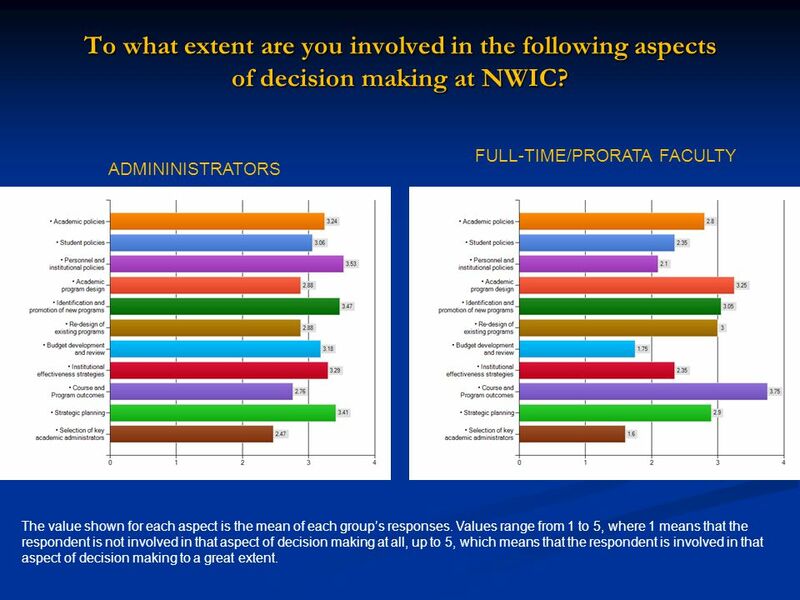 2 Number of Reponses to the Survey The primary groups surveyed were administrators on the NWIC Leadership Team, full-time and prorata faculty, and members of the NWIC Board of Trustees. 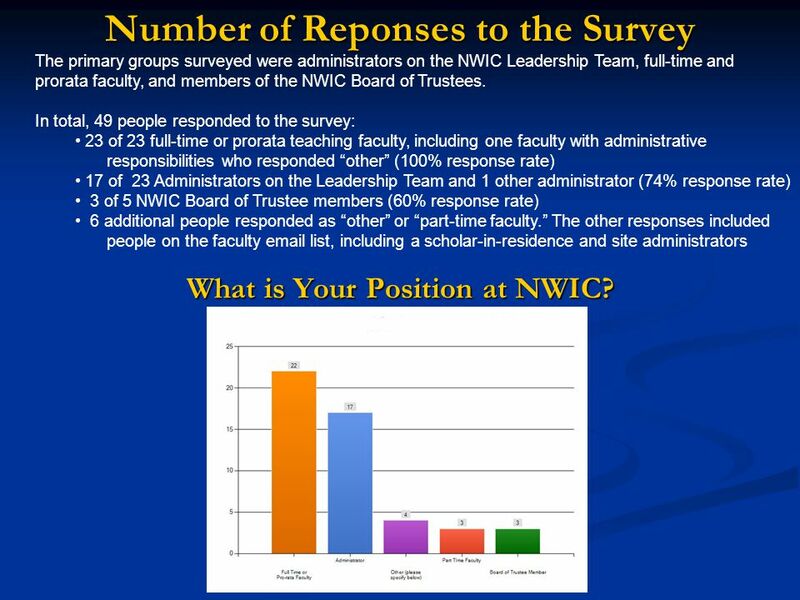 In total, 49 people responded to the survey: 23 of 23 full-time or prorata teaching faculty, including one faculty with administrative responsibilities who responded “other” (100% response rate) 17 of 23 Administrators on the Leadership Team and 1 other administrator (74% response rate) 3 of 5 NWIC Board of Trustee members (60% response rate) 6 additional people responded as “other” or “part-time faculty.” The other responses included people on the faculty email list, including a scholar-in-residence and site administrators What is Your Position at NWIC? 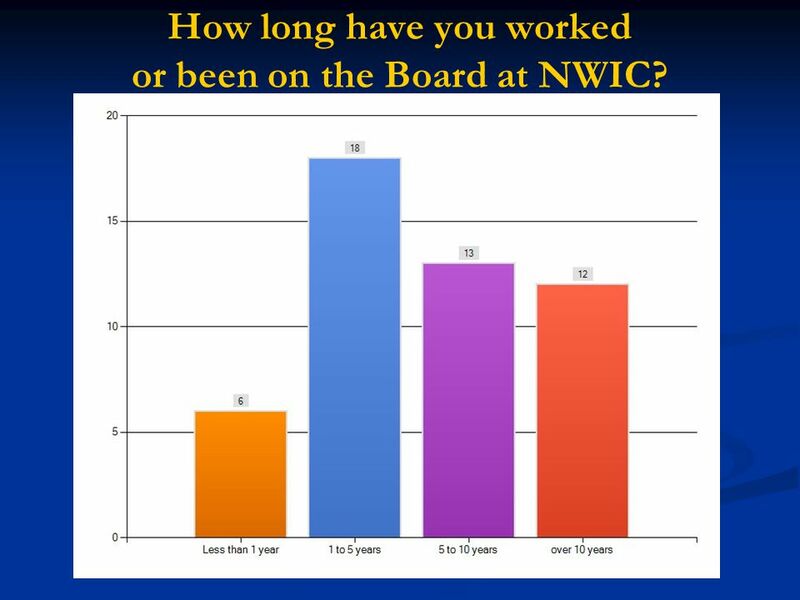 3 How long have you worked or been on the Board at NWIC? 11 To what extent do you believe that you have influence in the following areas? ADMININISTRATORS FULL-TIME/PRORATA FACULTY The value shown for each area is the mean of the group’s responses. Values range from 1 to 5, where 1 means that the respondent does not have any influence at all in that area, up to 5, which means that the respondent influences that area to a great extent. 12 To what extent do you believe that you should have influence in the following areas? ADMININISTRATORS FULL-TIME/PRORATA FACULTY The value shown for each area is the mean of the group’s responses. Values range from 1 to 5, where 1 means that the respondent should not have any influence at all in that area, up to 5, which means that the respondent should have influence in that area to a great extent. 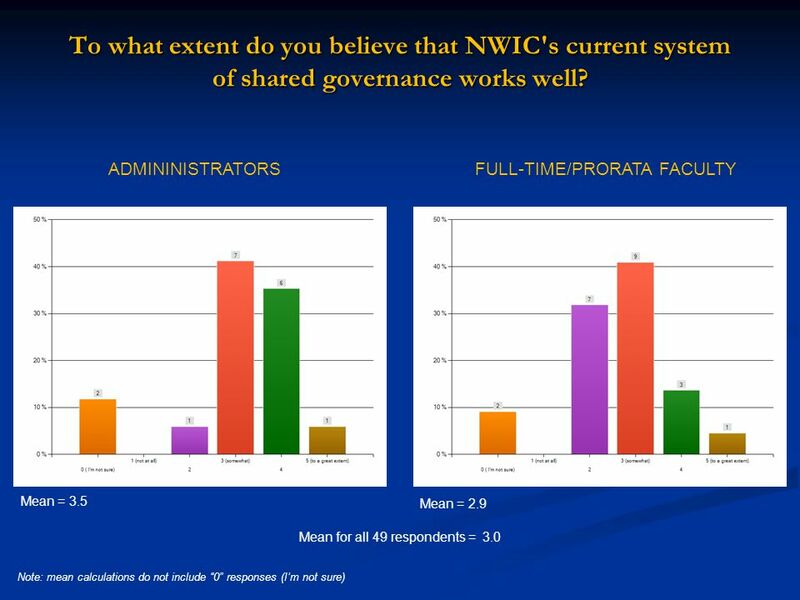 Download ppt "NWIC Shared Governance Survey January 2010. 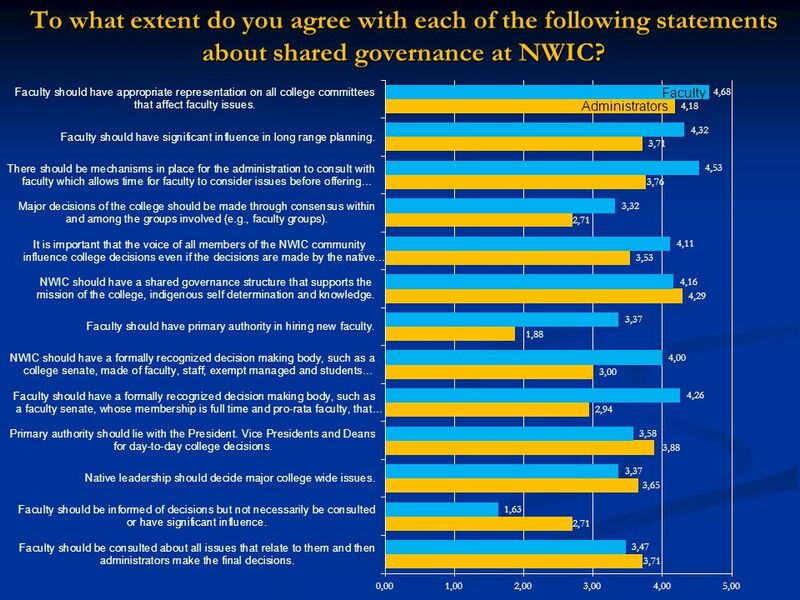 Number of Reponses to the Survey The primary groups surveyed were administrators on the NWIC Leadership Team,"
Forum on State Government and Citizen Participation Sponsored by: Center for State Policy and Leadership College of Public Affairs & Administration Public. Figure ES-1. Adoption of Culture Change by Nursing Homes, 2007 Culture Change Adopters 31% Culture Change Strivers 25% Traditional 43% Categories of Nursing. W HAT IS M UTUAL AGREEMENT AND P ARTICIPATORY GOVERNANCE ? Dr. Eric Oifer Randy Lawson August 26, 2010. Faculty Senate Faculty are consulted and given the opportunity for input on decisions that impact faculty members. – Faculty senate representatives. Campus-wide Presentation May 14, PACE Results. Austin Community College Noel-Levitz Student Satisfaction Inventory Executive Summary. Jenn Nichols, AAUP This PowerPoint Presentation was initially designed by long-time AAUP activist Glenn Howze ( ) Faculty Governance: Definitions. Next Accreditation System Safe Care for Current and Future Patients. Accreditation Climate Survey MC GAP May 1, Overview  Administered Fall 2012 via  Directly linked to the Accreditation Standards  Modeled. Law School Survey of Student Engagement Users’ Workshop November 4, 2011 Seton Hall Law School 1. Promoting Student Engagement: Involving Students with NSSE Planning and Results William Woods University NSSE Users’ Workshop October 6-7, 2005. Leader of the band or interested bystander? Elaine Hines – Manager Professional Development NZSTA. INQUIREINSPIREINNOVATEIMPLEMENT Leadership, Community and Values University of Washington LEADERSHIP, COMMUNITY and VALUES Preliminary Findings: Surveys.